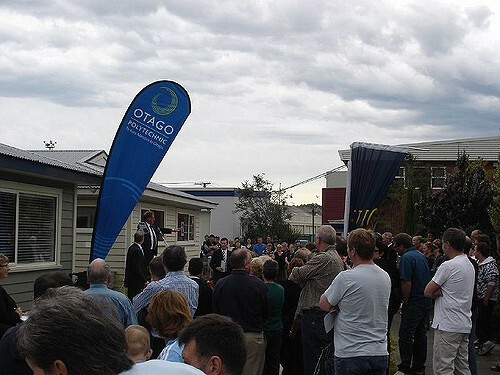 Recent results include auctions held in Northland, Auckland, Waikato, Bay of Plenty, Hawke's Bay, Taupo, Marlborough, Christchurch and Invercargill. Went on Auction result for Manukau and saw houses in Eastern Beach going for 20 % to 25% below CV. Also over the weekend new houses listed are comming with realistic price (Atleast thats what the listing agents are saying) to meet the market. From here on the speed of fall should be much and not just symbolic. As much as i expect prices to eventually give up and drop there is nothing in your comment to indicate that is the case. Any possibility for comparing the number of auctions and sales to the same time last year? I note the caveat placed on the numbers reported, I suspect that there may be a reason why this comparison is not being done. Off topic.... I note that comments appear in the comment stream prior to comment approval. I suspect this is not the intended functionality. You can see your own comment prior to approval, but no one elses prior to their approval. If this is not the case please let me know. "any one who values 'money' would like to have an increase in its price - which is the interest rate. But the debt level is so high that...:"
ah, got it. We are on to that now. Appreciated. "The results suggest auction room activity has remained relatively stable through the peak selling season, with little change in either auction numbers or sales rates over the last few weeks"
If 38% success rate is is stable for the "peak selling season" that what will be the result during the "off peak" season comig up in a month or two. Disaster for sellers and in particular the construction industry. Is this the real housing crisis that we have heard so much about? yes, if recession hits, will be a different story.. take aussie for ex. year ago, all was looking well, not so today.. Correct Big Daddy, if 38% is suppose to be good (Comfort) in Peak Selling Season than it reflects the condition of the market. While id guess it doesnt bode well for the market it could also simply indicate that with affordability stretched and owners believing in a shortage its simply not possible to get much more life out of the market than this. If there is no affordability available to drive exuberance then you dont get much sales activity but that is different to getting a subsequent sales crash. It would be extraordinary for NZ if auction success rates suddenly jumped up above 50% considering the current market climate. I was surprised that the success rate was this good. It certainly indicates stability and the chances of selling are still good if you have a reasonably priced and well marketed and desirable property. If the success rate was consistently well below 20% I think we could justify stating that there is a bit of a problem but NZ has traditionally not been an auction market. Auction success rates were only ever high in those sizzling hot few years when FOMO ruled. Calling this as the housing crisis is wishful thinking. It is the part of the cycle that goes up & down as markets are designed to do. With so many Kiwi's now locked out of owning their own homes, the government which should be doing something, this one, is still stumbling around in the dark half way through their first term. I honestly cannot remember watching a more politically incompetent lot over the last 40 years than the current ones. At least Clark's lot had some real rottweilers to take up the slack, but watching CoL is embarrassing. Well at age 52 I have come to the conclusion that no matter who was in, its never really made any difference to my life so I certainly would never sit back and put my failure on the government. You make your own life and the successes and failures. Looking back over time some of the past failures were actually lucky breaks your learned from. There are a handful of contributors here who would like to see a sizeable fall in house prices. The reality, however, is that the market remains resilient. I note that the word “stability” remains an apt description and is commonly used by article authors here - and in other forums.